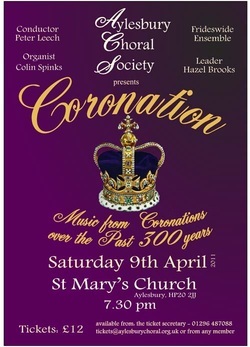 George V was the theme for the concert given by Aylesbury Choral Society at St Mary’s Church on Saturday April 9th 2012. The concert began with four pieces, by John Blow, Jeremiah Clarke and William Boyce, comparatively straightforward but none the less delightful pieces, accompanied by Colin Spinks on organ and Manuel Minguillon Nieto on the orbo. The next three pieces were on a grander scale and accompanied on the church organ: John Stainer’s stirring anthem Blessed is the Nation, and Parry’s I was Glad, both providing the choir with a chance to let rip. prepared by conductor Peter Leech. Big, bold and great fun, this was a real treat from the choir and period instrument orchestra the Frideswide Ensemble of Oxford. In the second half, they played a brilliant Overture by Boyce and accompanied three anthems by our greatest composer of coronation music, Handel, finishing with a roof-raising Zadok the Priest. Introductions by Peter Leech, who also revealed in the programme notes that while these days state occasions go like clockwork, in former times they were often chaotic occasions, enhanced the enjoyment of the audience. There was a great variety of music from four centuries and the choir were on terrific form, thoroughly deserving the enthusiastic applause from the packed house.